"Flying a gas balloon is unlike any other experience. There is no sound. No propellers, no jet engines. No burner, no heart-thumping rotors of a helicopter. Not even the wind that gliders experience. This is true, silent flight. For a child, a cluster balloon flight embodies all the magic in the world. In an adult’s eyes, a cluster balloon launch reminds of a dream so many of us once had, but has grown quiet. When you launch a balloon, part of the wonder is that you do not know where you will land. You are carried with the wind, towards destinations unknown. It is a wonderful adventure, and it is the most pure form of flight. 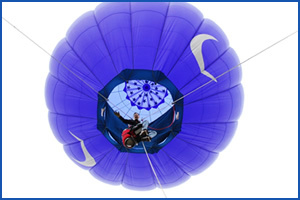 Jonathan Trappe is an FAA certified pilot, with a specific rating for Lighter-Than-Air: Free Balloons. In addition to flying hot-air balloons, Trappe has completed specific gas balloon training and has flown under multiple lighter-than-air gasses. Gas balloon flights have included international flights (crossing the English Channel from the UK to France, or crossing the Alps from France to Italy) and altitude shots to 20,053 feet. Distance and duration launches include a flight in a standard gas balloon where Trappe remained aloft for 68 hours, 46 minutes. On this flight, Trappe traversed six states and traveled over 1,214 miles. All flights are conducted in strict compliance with all Federal Aviation Regulations, and the FAA or civil aviation authority of the hosting country are always contacted before a cluster balloon launch. Working extensively with the FAA, Trappe has been issued an airworthiness certificate for one of his cluster systems, N878UP. Safety equipment in flight includes two-way aircraft radios, altitude encoding transponder, aviator’s breathing oxygen, aviation gps, and emergency locator beacon. To date and going forward, Trappe’s flights are always run with a primary focus on safety.